Record Company – Passion Music Ltd. The A side remix of Death...Samples an old d-shake tracks rumbling bassline (i think) also sampled on a track called slam by mental generation anyway this version is abit more of a relaxed cleaner type thing, still dope though. 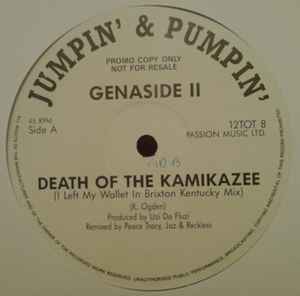 B-side is a spaced out track which doesnt retain much of the original apart from a couple of samples, vocoded voices dub delays etc not geared towards the dancefloor but still wicked genaside rawness its a pity an album was never released by genaside II around 91.